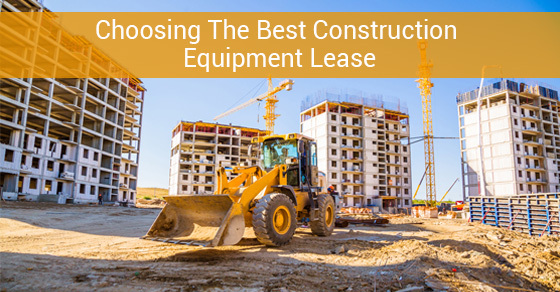 When it comes to leasing heavy equipment, you have more options than you probably realize. If you’re thinking of buying new or used equipment, you’re going to need pretty deep pockets. Heavy construction equipment is expensive and will definitely dam up your cash flow. To save money and to preserve your positive credit history, leasing may be the way to go. Whatever you decide, make sure you’ve weighed all the options and have discussed them with professionals in the leasing industry like the experts at Truck Loan Center. You can even work with a lender to fashion a customized lease that includes specific terms and payment options just for your needs. Lease to own. If you’re pretty sure you’re going to want to buy the piece of equipment after your lease option is up, lease to own might be for you. Monthly payments may be higher, so your buyout price will probably be lower. Fair market value. Essentially, this option lets you get the most up-to-date equipment with relatively low payments. A portion of the purchase cost is deferred to the lease’s end and you can make the decision to buy for a fair market value or to return the piece to your leasing company. Or, you could go on leasing monthly. Line of credit lease. If you’ll be needing a piece of equipment for a specific timeframe, look into the lease line of credit possibility. You’ll be getting a custom built line of credit for a definitive amount when you might need more than one piece of equipment for a limited time. Sale leaseback. This option will let you use the equipment you own to help with growth and capital needs. If much of your cash is in the assets of your equipment, with a sale leaseback, you’ll be able to sell your loan company that equipment for a fair market value of what you paid for it. And the equipment stays with you by your company leasing it back from your lender. Stretch lease. Your lease will be stretched for more months, giving you lower payments each month. For instance, a 36-month lease might be stretched to 39 months. You’ll be able to buy out your lease earlier than its term, if you choose.